Sean Hendrix, Chief Engineer | EnerDel, Inc.
Today’s changing smart grid -- and the addition of alternative energy sources -- requires efficient and safe energy storage methods to help improve grid stability and address growing power quality, reliability and energy security needs. The new grid infrastructures taking shape across the globe are just beginning to take advantage of energy storage systems to support those times when the sun doesn’t shine or the wind doesn’t blow. Similarly, heavy-duty transportation applications require energy storage solutions that are safe, reliable and able to stand-up to the rigors of the road. Lithium-ion batteries are an ideal energy storage solution that delivers a high energy and power mix, high cycle times and calendar life suited to these applications. However, recent, isolated events within the battery community have cast a shadow on the lithium-ion battery industry. In reality, given current technological advances, lithium-ion batteries can offer one of the safest solutions available. Whether energy storage systems are powered by batteries, mechanical storage, or compressed or pumped-hydro electric, they all carry some challenges the way they capture and contain energy. But, the risks involved with energy storage are not unique to electricity. Since the industrial age fossil fuels, which are a form of stored energy, have presented safety problems across the entire process of extraction, refining and delivery. However, we are all familiar with the dangers and the steps required to safely use fossil fuels. Does this make fossil fuels safer and electrical energy storage systems more dangerous? No, but the risks are different. From a physics standpoint -- regardless of whether the solution uses advanced lead acid, lithium-ion, sodium sulfur or any other chemistry -- storing large amounts of energy in a small space upsets the energy source’s natural equilibrium. However, once captured and contained, the energy must then be managed and released. The successful implementation of an energy storage system requires that these phases are managed in a controlled manner to ensure the system performs reliably and safely. Nearly everyone is familiar with Aristotle’s saying, “The whole is more than the sum of its parts,” and nowhere is this truer than in the design of an energy storage system. The saying also underpins EnerDel’s safety philosophy, which in one word, can be stated as “holistic.” With any energy storage system, safety must begin at the lowest component level, but must also include every subsequent building block that goes into producing the entire system. Each and every level of assembly adds to the amount of stored energy, but it also adds complexity, which must be managed properly to ensure safety. While cell chemistry, packaging, design, and manufacturing are each important building blocks in EnerDel’s holistic approach to lithium-ion battery safety, cell chemistry is a critical starting point. 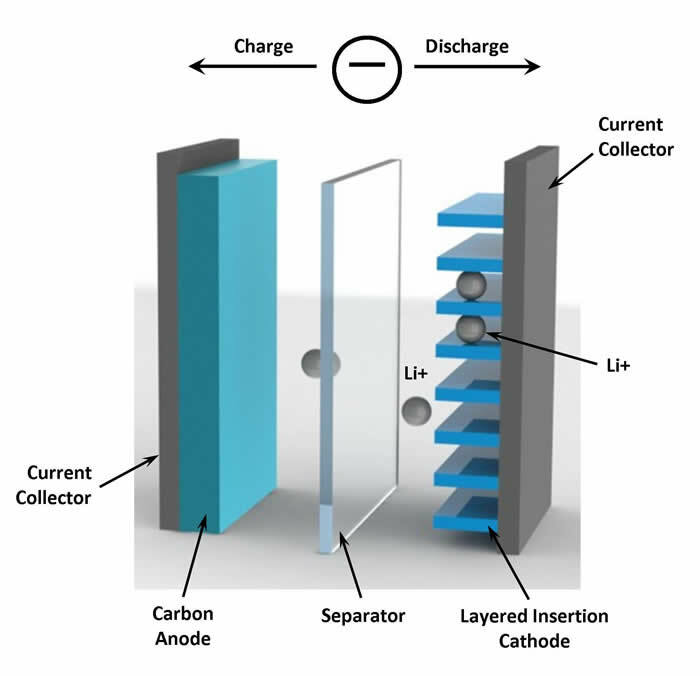 The essential parts of a lithium-ion battery cell are the cathode, anode, separator, electrolyte, packaging, and tabs. The cathode is a material that contains lithium ions within its crystal structure. The anode accepts the lithium ions from the cathode during charge and then releases them during discharge. The separator, which electrically isolates the cathode from the anode to prevent internal short circuits, contains small pores that allow the lithium ions in the electrolyte to travel between the cathode and anode during charge and discharge (see figure 1). The cell package contains the cathode, anode, separator, and electrolyte, while tabs allow electrical connections to be made. Careful selection of these components and cell design improve the safety, life expectancy and performance of a lithium-ion cell. Cell chemistry selection - EnerDel’s cathode material is a mixed oxide, namely lithium nickel manganese cobalt (NMC) oxide. The earliest available cathode material for lithium-ion cells was lithium cobalt oxide (LCO), which is still used in batteries for small consumer products, such as mobile phones and laptops. EnerDel’s NMC cathode material is inherently safer than LCO; it has a thermal runaway onset temperature 50 degrees C higher than that of LCO. When discussing lithium-ion batteries, thermal runaway refers to a situation where the cell temperature reaches a threshold that causes an uncontrollable rapid release of energy and corresponding temperature rise resulting in a thermal event. 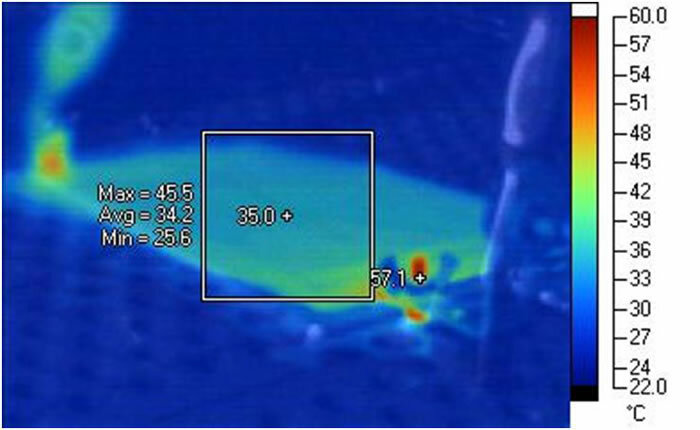 EnerDel anode material is hard carbon. Most commercially available lithium-ion cells utilize graphite, which has many positive attributes. However, hard carbon exceeds graphite in providing higher power density and smaller volume changes when charged and discharged, which encourages longer mechanical stability and life expectancy. Hard carbon is also more resistant to degradation reactions, such as dendrite formation, and offers more chemical stability. The electrolyte in commercially available lithium-ion cells, such as EnerDel’s Moxie+ Prismatic Cells, contains organic solvents and a salt. Familiar battery technologies such as lead-acid, alkaline, nickel cadmium, and nickel metal hydride use a water-based electrolyte, which is compatible to their voltage range of about 1.2V to 2.1V. The higher voltage of lithium-ion cells requires the use of organic, solvent-based electrolyte because water would be decomposed if used. The organic solvents used in lithium-ion cell electrolyte are flammable, so it is critically important that they are properly sealed and contained within the packaging. EnerDel cells use just enough electrolyte to fill the pores of the electrodes and separator. This minimizes the chance of electrolyte leaking from the packaging should a breach occur. The EnerDel separator is a polymer that encases the cathode and anode electrodes using Z-fold winding, which immobilizes the electrodes so their alignment is maintained though the life of the cell. The separator helps shut down the cell by melting and thus closing its pores if high temperatures are experienced. EnerDel’s cells are packaged in laminate, which allows for efficient packing. Appropriately-sized (thickness) tabs are easily sealed into laminate packaging with high mechanical strength. Since the multi-layer laminate consists of aluminum foil sandwiched between layers of electrically-insulating polymers, the risk of shorting to the metal case is eliminated. In contrast, cylindrical cells require the use of many more parts, which can increase the risk of manufacturing flaws and short-circuits. Cell design - Some lithium-ion cells have a cylindrical configuration with a long sheet of wound-up electrodes and separators inside. EnerDel’s cells are configured in a flat stack of electrodes, which results in better uniformity of their electrical, mechanical, and thermal properties. The flat stack also provides a more uniform current density enabling prismatic cells to support higher currents with lower temperature rise than cylindrical cells. This is particularly important in large format cells with high capacity (See figures 2 & 3). Cell manufacturing - EnerDel purchases high-quality raw materials and manufactures cells according to strict manufacturing standards to ensure uniformity and consistency. Cell uniformity is essential for safety, durability, and performance. Three key directives of the EnerDel product design philosophy are care, monitor and manage. Any design developed by EnerDel must care for the cell, monitor the health of the cell and manage the cell environment. We care for the cell by providing a compliant location for it to occupy. We monitor cell health through voltage and temperature measurements, and we manage the cell environment by giving it a method to better manage heat dissipation. Stacked prismatic cells offer benefits in packaging efficiency and heat removal. stemming from its deep knowledge of lithium-ion cell behavior. However, they present a set of unique needs that must be addressed to successfully package them into a module. The first requirement is that the cell stack, or the layers of anodes and cathodes that are interleaved in the prismatic cell, must be stabilized within the module. Whether the module is to be used for a mobile or stationary application, mechanical retention of the anode and cathode layers is critical. The second requirement is that the cell must be allowed to ‘breathe.’ This breathing function is the natural expansion and contraction of the cell as it undergoes charge and discharge cycles. This is caused by the transport of lithium-ions within the cell that results in a natural volume change or “breathing” of each electrode. 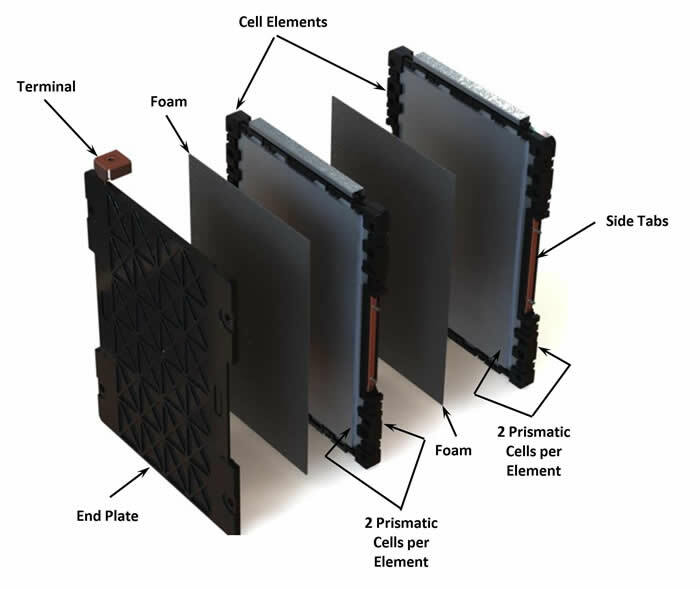 EnerDel addresses stabilization and volume change needs through the use of a foam sheet that is paired with each cell of our module design (see figure 4). The foam sheet, in conjunction with the module end-plates and cell elements, stabilizes the cell stack by applying a uniform pressure across the entire surface area of the cell face. The foam hangs over the active area of the cell creating a ‘picture frame’ around the periphery of the cell stack. In effect, the cell stack is restrained from any physical movement which could cause internal shorts. The foam also allows the cell to breathe by providing a compliant layer between a cell and its adjacent neighboring cell. In conjunction with the foam, the module assembly is designed to compress the cells. This force promotes ionic conductivity and results in low internal cell resistance and heat generation. The mechanical pieces that form the module are made from an electrically-insulating material, which is self-extinguishing per UL 94. The material is also chemical resistant. In addition to providing the backbone for the compressed cells, the mechanical module also protects the prismatic cells from mechanical intrusion. At every electrical connection level, special attention must be given to connection points. This starts from the moment the two cell tabs are joined and continues to the point where two high voltage power busses are brought together. Loose connections can be the cause of catastrophic system failures by creating high electrical resistance which generates heat. EnerDel employs a unique mechanical cell tab joining method. Other methods, such as ultrasonic or laser joining, are not able to create an error-proof joint without destroying the joint. This is why EnerDel uses a mechanical joint using fasteners and dynamic torque (closed-loop torque control with thread-locker) to provide real-time confirmation of joint integrity every single time. Non-conforming connections are immediately flagged, rejected or rectified. EnerDel has field-tested thousands of modules using this joining method and has never experienced a failure. Module-to-module connections and system connections are also treated just as carefully. Permanent connections utilize plated fasteners, torque control and thread-locker as part of the design requirement. When paired with our manufacturing and quality systems, we deliver a robust assembly process. In stationary applications, the ability to remove a module from the system quickly and easily are important. EnerDel has developed a tool-less interconnect that is easily removed by maintenance personnel wearing Personal Protective Equipment (PPE). The tool-less interconnect provides positive, tactile feedback when connecting and is designed to meet the directives of IEC 60664-1, Insulation coordination for equipment within low voltage systems, pertaining to creepage and clearance. EnerDel utilizes a systems architecture approach that dictates the system be broken-up into discrete cells of the appropriate capacity. Starting at the module level, cells are compartmentalized from their neighbors (see figure 4) in one-or-two cell groupings commonly referred to as an element. Building the system from the module level up, modules are packed into module groupings. Sometimes an intermediate package called a sub-pack is used, which is a method of packaging modules where the enclosure provides compartmentalization. This detailed attention to packaging provides the best approach to mitigate thermal runaway from the lowest building block to the entire energy storage system. While cells are an important aspect, other factors must be taken into account for a successful systems design. For example, incorrect sizing of high-voltage buss bars and poor connection methodology can create a high resistance joint which will become a “hot spot.” In essence, it can become a bottleneck to the flow of energy which can become a potential safety issue. A battery system’s electrical string configuration, including the location of contactors, fuses and current sensing all the way down to the sizing of high voltage buss bars, contribute to the safety of the product. In a mobile or transportation application, modules are electrically strung together to form a pack that must meet the demands of this market. EnerDel prides itself with numerous pack designs that have successfully and safely provided battery solutions for the transportation industry. EnerDel has experience in designing packs that meet the demanding test and validation requirements of the United States Advanced Battery Consortium (USABC) and the United Nations Department of Transportation (UNDOT). EnerDel has designed packs that are exposed to the elements on the underside of a vehicle and are subject to crash testing by the manufacturer where the performance demands placed on the battery pack are significant. The level of design and testing in a stationary energy storage system is just as thorough as it is with EnerDel’s transportation packs. From requirements listed by the Institute of Electrical and Electronics Engineers (IEEE), Underwriters Laboratories (UL), to the International Electrotechnical Commission (IEC) and the Uniform Building Code (UBC), EnerDel has the experience to design/build energy storage systems that meet these requirements. All of EnerDel’s packs, both mobile and stationary, are designed to meet the stringent IEC 60529 requirements, which defines the degrees of protection required for electrical equipment. Even packaging materials used to ship our products are designed and tested to ensure the product reaches its destination in good, safe condition. Additionally, complementing the Battery Management System (BMS) safety features, at the request of specific customers, EnerDel has successfully integrated an optional fully autonomous (independent from control by the BMS) fire suppression system that is activated by high heat in both a custom heavy-duty transportation pack and a large scale energy storage system. While the cells provide the brawn of the battery system, the Battery Management System (BMS) is the brains of the operation. and control the lithium-ion battery system. The BMS coordinates information from the cells, contactors, current sensors and end-user inputs to continually monitor and adjust the operation of the battery system. The BMS embedded controllers include software with highly developed algorithms for diagnostic and control decisions. While safety may seem to be the only function of the BMS, it is important to note that the BMS is the health care provider that ensures a long lifespan for the battery system. The BMS is the mechanism where safety, cell life, optimal capacity, and application controller communications are all handled. No other BMS electronics on the market today contain comparable capabilities to EnerDel’s BMS electronics. EnerDel has significant intellectual property (IP) tied to being able to monitor and manage functions like state-of-charge (SOC), state-of-health (SOH), contactor control, pre-charge, cell balancing and high voltage isolation detection. EnerDel mandates redundant design and management features in its battery systems to prevent the potential for thermal runaway to occur. These features would include the ability to monitor temperatures via a comprehensive array of sensors adjacent to the cells and controllers, and correspondingly limit or cease electrical current based on temperature and/or SOC. From the product concept phase through the manufacturing process EnerDel has control of the entire process. EnerDel employs a careful and deliberate method to ensure we achieve safe and reliable products. Starting with the desires of our customers, EnerDel brings each concept to life through the use of cutting edge design tools and simulation software. the product design is faithfully carried out by manufacturing. Using Computer Aided Design (CAD) software, 3D models are created and then analyzed for mechanical and thermal performance. Analysis software that allows us to perform Finite Element Analysis (FEA) to confirm structural integrity and Computational Fluid Dynamics (CFD) software that helps us confirm the performance of a thermal management system are all part of the process. Once a design has met the criteria, the physical testing and validation process continue the maturation of the product. Using proprietary in-house test methods and those tests spelled out by USABC, UNDOT, Society of Automotive Engineers (SAE) and IEC, EnerDel is able to use the validation process to physically verify the functionality and safety of the design and verify that the manufacturing process is capable of making the product as designed. This helps to ensure the product’s safe operation and performance. EnerDel believes that the test and validation process is the bridge between the virtual model and manufacturing a safe physical product. Also, from the earliest concepts through the maturation of a product, the manufacturing team is involved from the onset. Early involvement helps ensure smooth and safe manufacturing processes for every battery manufactured by EnerDel. Industry-leading manufacturing systems such as the deliverables of the Automotive Industry Action Group (AIAG) and the adherence to the advanced product quality planning (APQP) process help EnerDel achieve customer production part approval process (PPAP) certification. EnerDel employs an automotive-grade quality system based on AIAG product and manufacturing, development and qualification processes. safe products that meet both our internal and customer demands. Quality begins with a thorough understanding of customer’s requirements and how EnerDel’s product will be used in their application. EnerDel uses disciplined document and change control processes to convey and manage those requirements throughout our organization to each functional group, from sales to engineering to shipping. As product realization moves from design to manufacturing, process flow diagrams, FMEAs, and control plans are utilized to define and control a manufacturing system that is built around product requirements and is responsive to variations that might lead to non-conforming product. In-process and final testing are employed throughout cell and pack manufacturing processes to ensure critical customer and design requirements are met. Special handling methods are defined where appropriate to protect fragile or sensitive parts or material. Non-conforming material is immediately removed from the manufacturing area, tagged and processed through controlled steps to ensure it is properly disposed and does not get mixed in with good product. Shainin, Six Sigma and statistical problem solving methods and tools are applied to continuously improve our products and processes as well as to efficiently and effectively resolve manufacturing issues. Suppliers are assessed for their capability to deliver quality parts prior to receiving an order from EnerDel and the component parts and raw materials they provide are approved through application of PPAP requirements. Incoming materials are verified against product drawings and specifications to ensure they meet our design requirements. Additionally, equipment, gages and instruments used to test product as it is manufactured are all calibrated to maintain their accuracy. Lithium-ion battery system safety is EnerDel’s first and foremost consideration. From product concept to shipment, EnerDel’s dedication to safety takes a holistic approach encompassing the entire process. We’re pleased to provide you with a more in-depth look at our safety processes, procedures and protocols. Contact us at Info@EnerDel.com.